Justice Minister Tzipi Livni, who heads the Israeli team in peace talks with the Palestinians, said late Saturday in Washington that a two-state solution was in her country’s best interest. “The only way to keep Israeli values as a democratic state is by adopting the idea of two states for two people,” one for Israelis and the other for Palestinians, Livni said at a conference held by J Street, a leftist pro-Israel lobbying group. “The words Israel and peace are not in contradiction, they must live together,” she said. Israel, Livni added, is not the only country that sees “the grave threat” coming from Iran or from radical fundamentalist Islam in the region. “We have common interests with other Islamic and Arab states,” she said. These countries “feel like us that these are threats,” but “feel they cannot express this shared interest because we have this ongoing existing conflict between us and the Palestinians,” Livni said. Peace talks between Palestinians and Israelis were officially re-launched in July with support from US Secretary of State John Kerry. Separately, Israeli premier Benjamin Netanyahu left for New York early Sunday in a bid to challenge Iran’s “charm offensive,” and the view that the country is less of a nuclear threat under its new, more moderate president. Maariv newspaper said in its Sunday edition quoting an informed dipomatic source that Israeli-Palestinian negotiations have reached to a deadlock. The deadlock has been marked when Israel refused to discuss land swap idea during the first meeting on borders issue, according to the diplomat. He added that the negotiaitons would remain absurd until the US administration intervenes or a meeting between Natenyaho and Abbas is held. Ramallah Foreign minister Riyad al-Maliki said Israel behaves as if negotiations have just begun, adding that if negotiations have not ended in a solution during Obama's term, they would never succeed during any other future terms. Chief Israeli negotiator Tzipi Livni said "true peace will not be achieved as soon as an agreement is signed with the Palestinians," adding that she is "struggling for protecting the security interests of Israel. In her speech to the annual conference of J Street, an American lobby and a pro-Israel organization, Livni called on the authorities supporting Israel to "fight for peace," adding that "the only way to protect a democratic, Jewish Israel lies in the two-state-for-two people solution. Jenin and many other sites are witnessing during these days clashes between the occupation soldiers and large numbers of Palestinian youths, because of the Israeli raids. Youth activist Bilal Nassar told PIC's correspondent: "This young generation is no longer able to remain silent vis-à-vis the settlement activity and the occupation provocative practices. 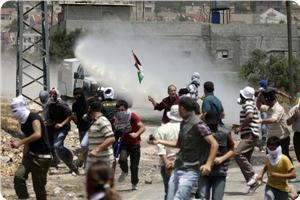 They are leading the confrontations that erupt whenever the occupation storms the region." He stressed that these young people, between the ages of 17 and 22 years, are expressing a general state of anger and aim to recreate the spirit of resistance in the West Bank. 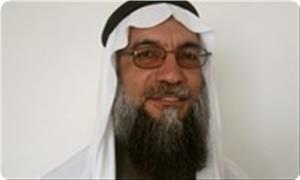 The activist Walid Yassin told to PIC's correspondent that the youth groups have chosen the option of resistance in its different forms; they are escalating their confrontations with the occupation at the points of contact and are forming a front for rejection of negotiations and normalization. For her part, youth activist Lama Tawil revealed that the PA security forces have been chasing these groups by arresting its members, questioning them and exposing them to threats. She added that these PA's methods are no longer relevant as this young generation does not fear the threats. They seek to change the Palestinian reality and work on achieving the unity of all Palestinians in the light of the resistance. Palestinian President Mahmoud Abbas addresses the U.N. General Assembly on September 26, 2013 in New York City. Palestinian Authority (PA) President Mahmoud Abbas said the prospects of a peace deal between the PA and Israel have never been such bleak as they are now. Abbas made the remarks Thursday in a speech to the 68th United Nations General Assembly. “Time is running out, and the window of peace is narrowing and the opportunities are diminishing,” he said. He also renewed his call to the international community to pressure Israel to stop its illegal settlement activities on the Palestinian land. The fresh round of negotiations began in July to end the decades-long Palestinian-Israeli conflict based on the so-called two-state solution after a three-year hiatus. Peace in the Middle East? Not if Benjamin Netanyahu has anything to say about it. On Monday, Sept. 30, U.S. President Barack Obama will welcome Israeli Prime Minister Benjamin Netanyahu to the White House for the first time in 18 months. Much has changed in the intervening period -- both leaders have been re-elected, Obama has made his first visit as president to Israel, Israeli-Palestinian peace talks have been relaunched, and that rather pragmatic-sounding Hasan Rouhani chap has been elected president in Iran. In what might be called an anti-"Asia pivot" speech, Obama announced to the U.N. General Assembly this week that the United States is engaged in the Middle East "for the long haul" and that "in the near term, America's diplomatic efforts will focus on two particular issues: Iran's pursuit of nuclear weapons and the Arab-Israeli conflict." That message will be viewed as a mixed bag in Jerusalem, which is keen for a greater American footprint in the region but is less enthusiastic about the idea of peacemaking with the Palestinians and deal-making with the Iranians taking top billing. For that reason, the upcoming White House meeting will likely find the two leaders back on familiar terrain, more focused on testing each other's underlying intentions than on working together as close allies. The U.S. president is something of an open book, but Netanyahu's approach requires a little more interpretation and context. Too much of that analysis has been consistently wrong, and thankfully so. If prominent Netanyahu watchers had gotten it right, we would be marking the second or third anniversaries of Israeli bombing campaigns against Iran. Netanyahu is indeed back in threatening mode. His latest rhetorical flourish is to quote Hillel's ancient maxim "If I am not for myself, who will be for me?" -- an upgrade of his previous refrain regarding Israel's "right to defend itself by itself." That language is being widely interpreted by Israeli commentators as a reaffirmation of Israel's willingness to strike Iran alone if Netanyahu's red lines on Iran's nuclear program are deemed to have been crossed. This debate has taken on a new urgency given the diplomatic opening seemingly created by the election of Rouhani. It is no secret that Netanyahu has been dragged out of his comfort zone by the possibility of a U.S.-Iran rapprochement. Former President Mahmoud Ahmadinejad's aggressive and insulting behavior made him a convenient adversary for Israel; Rouhani and his diplomatic team, notably polished Foreign Minister Javad Zarif, present a challenge of a very different order of magnitude. Under these new circumstances, the nagging question for Washington policymakers is whether Netanyahu's tough line on engaging the new Iranian reality is the wise approach of an understandably cautious and concerned Israeli leader, or whether this Israeli pushback is indicative of a more intransigent stance. The pushback has been nothing if not relentless: Netanyahu has called for an intensification of sanctions and military threats, has depicted Iran's new leader as a "wolf in sheep's clothing," and has heaped scorn on the Rosh Hashanah greetings sent to the Jewish world from Iranian leaders' Twitter accounts. The Israeli Embassy in Washington even crafted a fake LinkedIn account for Rouhani, which listed his skills as "weapons of mass destruction" and "illusion." Sadly, the preponderance of evidence suggests that this is not just about Israel's leader driving a hard but realistic bargain. If Netanyahu's principal concern is really the nuclear file, he should be able to come to terms with the fact that a negotiated outcome offers the best long-term safeguard against Iran developing a nuclear weapon. The most that military strikes could achieve would be a short-term delay of Iran's ability to weaponize its nuclear program -- a decision that Iran has anyway not yet made, according to the consensus among Western intelligence agencies. A strike would also create a greater incentive for Iran to weaponize its nuclear program. At the moment, however, Netanyahu is signaling that there is no realistic deal that would be acceptable to Israel. For instance, a consensus exists among experts and Western officials that Iran's right to enrich uranium -- in a limited manner and under international supervision -- for its civilian nuclear energy program will be a necessary part of any agreement. Netanyahu rejects this. The reason lies in Netanyahu's broader view of Israel's place in the region: The Israeli premier simply does not want an Islamic Republic of Iran that is a relatively independent and powerful actor. Israel has gotten used to a degree of regional hegemony and freedom of action -- notably military action -- that is almost unparalleled globally, especially for what is, after all, a rather small power. Israelis are understandably reluctant to give up any of that. Israel's leadership seeks to maintain the convenient reality of a neighboring region populated by only two types of regimes. The first type is regimes with a degree of dependence on the United States, which necessitates severe limitations on challenging Israel (including diplomatically). The second type is regimes that are considered beyond the pale by the United States and as many other global actors as possible, and therefore unable to do serious damage to Israeli interests. Israel's leadership would consider the emergence of a third type of regional actor -- one that is not overly deferential to Washington but also is not boycotted, and that even boasts a degree of economic, political, and military weight -- a deeply undesirable development. What's more, this threatens to become a not-uncommon feature of the Middle East: Just look at Turkey under Prime Minister Recep Tayyip Erdogan, or Egypt before the July 3 coup, or an Iran that gets beyond its nuclear dispute and starts to normalize its relations with the West. There are other reasons for Netanyahu to oppose any developments that would allow Iran to break free of its isolation and win acceptance as an important regional actor with which the West engages. The current standoff is an extremely useful way of distracting attention from the Palestinian issue, and a diplomatic breakthrough with Iran would likely shine more of a spotlight on Israel's own nuclear weapons capacity. But the key point to understand in interpreting Netanyahu's policy is this: While Obama has put aside changing the nature of the Islamic Republic's political system, Israel's leader is all about a commitment to regime change -- or failing that, regime isolation -- in Tehran. And he will pursue that goal even at the expense of a workable deal on the nuclear file. Netanyahu's maximalism does not represent a wall-to-wall consensus within the Israeli establishment. There is another Israeli strand of thinking -- notably among retired security elites like former Mossad chiefs Meir Dagan and Efraim Halevy and former Shin Bet chief Yuval Diskin -- that holds that the challenges posed by Iran can be managed in different ways at different times. Others inside Israel's establishment acknowledge that the current period of unchallenged hegemony is unsustainable and that adjustments will have to be made. Some understand the efficacy of having an Iran more tied into the international system rather than isolated from it -- a deal on Iran's nuclear program, for instance, could also have its uses in limiting the maneuver room of groups like Hezbollah and Hamas. But Netanyahu has rejected these positions. The prime minister is nothing if not consistent: He was similarly intractable when the Palestinian leadership and the Arab League put forth pragmatic proposals. While the PLO's leadership accepts Israel's existence, the 1967 lines, and an accommodation on Israeli settlements (including in East Jerusalem) by way of land swaps, Netanyahu has shifted the goal posts -- rejecting the 1967 lines and refusing to take yes for an answer. With the Arab League's "Arab Peace Initiative" offering recognition of Israel and comprehensive peace in exchange for withdrawal from the occupied territories, Netanyahu is again following this pattern of rejectionism. Netanyahu is a deeply ideological leader with an unshakeable belief in a Greater Israel and regional hegemony. If this reading of him is accurate, it bodes ill for Israel's reaction to the nascent diplomacy between the United States and Iran. In the coming weeks and months, Netanyahu will likely dedicate himself to derailing any prospect for a diplomatic breakthrough. In that mission he is, of course, not alone. He will be joined by American hawks and neoconservatives, Republicans who will oppose Obama on anything, and some Democrats with a more Israel-centric bent. Their efforts will be concentrated on escalating threats against Iran, increasing sanctions, and raising the bar to an impossibly high place on the terms of a nuclear deal. All this will serve -- intentionally, one has to assume -- to strengthen hard-liners in Tehran who are equally opposed to a deal. Of course, the Iranian forces ranged against Rouhani's pragmatism do not need encouragement from Washington. But absent encouragement, they are not in the ascendancy -- and crucially, Rouhani appears to have the backing of Supreme Leader Ali Khamenei for his diplomatic outreach. Currently, the difference among the three capitals -- Washington, Tehran, and Jerusalem -- is that only in Jerusalem does a representative of the hard-line faction, rather than the pragmatic camp, hold the most senior political office. If Netanyahu wants a way out from bombing Iran, he could simply declare victory. It would be an easy speech to write: Bibi would declare that it was only Israeli pressure for sanctions and a credible military threat that created the conditions for a nuclear deal with Iran. Even if Netanyahu is wrong on the details regarding sanctions and threats -- they have often hindered, not advanced, progress toward a deal -- the desired result will have been achieved. 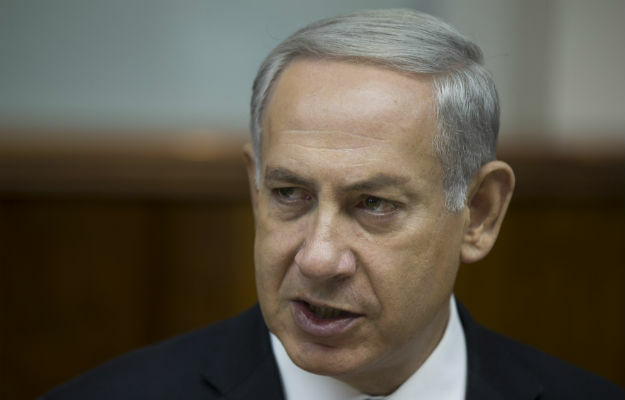 Netanyahu is not under Israeli public pressure to strike militarily or reject a deal. His security establishment is divided but wary of going solo, and even his cabinet is split on the issue. And this is why Monday's White House meeting matters so much: While Obama retreated on the Palestinian issue when Netanyahu stared him down -- first on settlements and then on the issue of using the 1967 borders as the basis for a deal -- on Iran they have so far deferred their disagreements. But that option may be reaching its expiration date. The Iran issue is now more urgent, and if progress is to be made on either of the priorities Obama highlighted at the United Nations -- Iran and Israeli-Palestinian peace -- the president will need to become defter at outmaneuvering his Israeli guest. Netanyahu's calculations and his actions will be affected by clear signals from Washington, Europe, and elsewhere to stop undermining diplomacy, and making the case for the unrivaled benefits of a deal with Iran. After decades spent boxing in Tehran, the interests of global and regional security -- and even of Israel itself -- may now require a short, sharp burst of boxing in Bibi. In his first speech as the President of Palestine at the United Nations General Assembly, President Mahmoud Abbas said that the time for peace has come, and that the International community must pressure Israel to end its violations, and illegal settlement activities. Abbas said that the State of Palestine will practice its role, amongst other nations, in a positive manner that serves peace and stability in the region. He stated that filing applications at the United Nations aims at achieving international recognition of the legitimate Palestinian rights, and that all diplomatic moves are not aimed, in any way, at delegitimizing Israel. “We are holding negotiations with Israel, we have clear and truthful intensions; we committed to successful peace talks”, President Abbas added, “We are faithful to our commitments, peace means lifting this historic injustice inflicted on the Palestinian people since the Nakba of 1948”. He said that peace talks aim at reaching an agreement that leads to the establishment of an independent Palestinian state, and added that the Palestinians will not accept interim agreements. “We want to reach a permanent and comprehensive peace deal with Israel”, Abbas elaborated, “A State in all Palestinian territories captured by Israel in 1967, with East Jerusalem as its capital, we are committed to fulfilling our obligations to achieve peace within 9 months”. The President further stated that the International Community must act on stopping any actions that jeopardize peace talks, and must end all Israeli violations against holy sites. “Occupation, settlements and walls do not achieve security, and cannot achieve a lasting peace in the region”, Abbas said, “Let us build bridges of peace, instead of walls; let’s build a just and comprehensive peace, peace based on logic, justice and human rights”. Abbas added that Palestine does not interfere into internal affairs of Arab states, and supports all nonviolent activities, and the peaceful, legitimate, choices of nations. “There is no mission that is more noble than the mission of”, he said, “Our mission is to achieve peace in the holy land, to fulfill the message of all religions”. Israelis and Palestinians have agreed to intensify peace talks aimed at reaching a final agreement, not an interim accord, U.S. Secretary of State John Kerry said on Wednesday. The two sides met on the sidelines of the United Nations General Assembly in New York at a conference of donors looking for ways to revive the fragile Palestinian economy. Speaking before the closed-door meeting known as the Ad Hoc Liaison Committee, Kerry said the goal of talks between Israel and the Palestinians is a "final status agreement," not an interim one. On Tuesday, President Barack Obama met Palestinian Authority President Mahmoud Abbas, and he plans to meet with Israeli Prime Minister Benjamin Netanyahu next week in Washington. Both sides expressed their commitment to the peace talks at the Ad Hoc meeting and noted the determination of the U.S., and Kerry in particular, to move the process along. "This is a 50-year-old conflict, and it's inevitable that we have to find closure to it," Palestinian Finance Minister Shukri Bishara said. "It's impossible to continue as is." 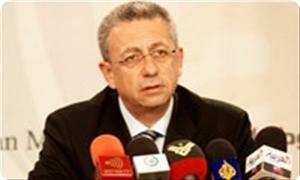 The new Palestinian new finance minister called Wednesday's economic talks "very, very successful." The donor meeting asked Israel to ease some of the restrictions that have hurt employment, trade and other crucial areas of the Palestinian economy. An International Monetary Fund staff report on West Bank and Gaza economies released last week said extensive Israeli restrictions on movement and access should be eased and eventually removed. The donors on Wednesday also asked the Palestinians to rein in expenditures and take steps to "develop a business-friendly environment." They are facing a $350 million financing gap projected for this year. The Palestinians depend heavily on aid from donors – about $1.3 billion this year, or the equivalent of nearly 12 percent of annual gross domestic product. But the aid has been falling in recent years, along with optimism over peace. Both sides appeared unusually upbeat after Wednesday's meeting, despite the challenges. And they acknowledged they have little time to be otherwise. "We are particularly conscious of the fact that we can't build a state that almost totally depends on foreign grants," Bishara told reporters after the meeting. But he stressed: "We have to ensure that one state is close in its standard of living to the other state." The income gap between Israel and the Palestinians remains vast. Israeli Cabinet minister Yuval Steinitz called the meeting "positive" and said a "strong, viable Palestinian economy" helps to create a better political climate – as long as Israeli security needs are not damaged. Both sides have resumed dialogue between finance ministers, Steinitz said. Other moves include another 5,000 employment permits for Palestinians and allowing more water and construction and cellular equipment into the Gaza Strip. Within weeks after the Arab uprisings erupted in late 2010, Palestinians began voicing concerns that their struggle with Israel, the region’s main diplomatic preoccupation for decades, would be pushed into the shadows. As predicted, the upheavals in Libya, Egypt, Bahrain and Syria soon replaced the Palestinian cause as the centre of diplomatic attention in Arab and western capitals. Now the crisis over Syria’s chemical weapons and renewed hopes of a multilateral deal with Iran over its nuclear programme have, if anything, worsened the Palestinians’ predicament, said Palestinian Authority (PA) officials and analysts. 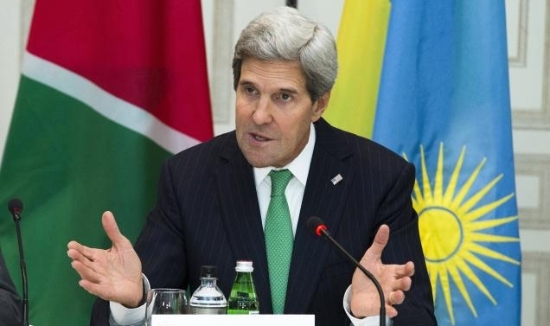 The resumption of talks with the Israelis in July, spurred by the dogged efforts of US Secretary of State John Kerry, provided a fleeting glimmer of hope. Since then, however, the negotiations have been orphaned by Washington, which instead has focused on efforts to cobble together a deal to put Syria’s chemical weapons arsenal under international supervision. 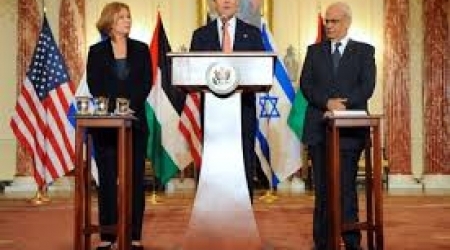 A particular source of dismay for the Palestinians is the absence of Martin Indyk, the chief US envoy to the talks, from all but one of the six negotiating sessions that have taken place so far. “We complained to the [US] administration but they’ve done nothing,” the Palestinian official said. 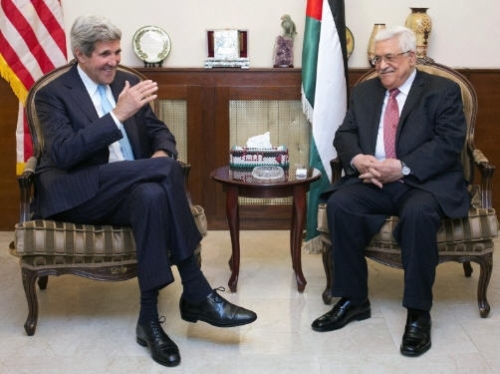 Mr Kerry has acknowledged that his preoccupation with other issues has come at the expense of the Palestinian-Israeli talks and reportedly has promised Palestinian Authority President Mahmoud Abbas that he would devote more time to advancing them. 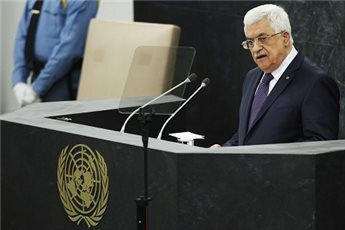 Despite these reassurances, however, there is a lingering suspicion among Palestinian officials that the Israelis and Americans have again abandoned Mr Abbas and left him politically exposed, even after he appeased Israel and the US by opting in favour of talks instead of further moves for Palestinian statehood in multilateral organisations. That suspicion was reinforced after the restart of negotiations, when Israel announced the construction of more than 3,000 new homes for Jewish settlers in the occupied West Bank and East Jerusalem. Still, the PA officials have little choice but to mute their criticism, due to their dependence on aid from Washington. 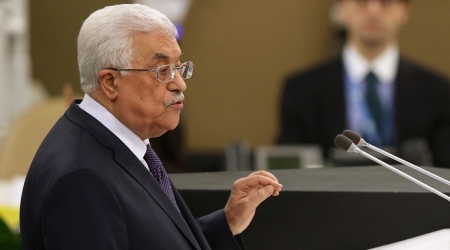 Mr Abbas does not want to anger Washington, Palestinian officials said. “They are doing everything by the book because they know they will be blamed if the talks fail,” said Nour Odeh, a former PA spokeswoman. Labib Kamhawi, an independent political analyst who lives in Amman, said there are precedents for continuing some semblance of talks and crises swell elsewhere, citing Palestinian-Israeli peace initiatives during the US-led invasions of Iraq in 1991 and 2003. More worrying still to the Palestinians are recent events in Egypt, which have seen Israel emboldened by the ouster of the Islamist president, Mohammed Morsi, and his replacement by a military-led interim government, Mr Kamhawi said. “If we are to conclude from all the latest developments, we can safely conclude that Israel is the only country that has benefitted from the situation,” he said. If there is any Palestinian that can be said to be worse off than a resident of the West Bank, it is a resident of the Gaza Strip. Israel has been joined in its blockade of the Gaza Strip by Egypt, which is collapsing the tunnels that have served as a vital economic channel to the outside world. Cairo fears that Hamas militants could join the Muslim Brotherhood if it chooses to take up arms against efforts by the interim government to eradicate it. Many ordinary Palestinians say that the removal of Mr Morsi, Hamas’s ally in Cairo, has undermined the one alternative to Palestinian-Israeli talks that could substantially improve the Palestinians’ predicament: Fatah-Hamas reconciliation. For Fatah officials who chaffed at being pushed aside by Mr Morsi as Cairo’s preferred Palestinian political faction, his ouster has brought quiet gloating. For leaders of Hamas, it has aroused “paranoia,” said Nathan Thrall, a Jerusalem-based analyst for the International Crisis Group. “They do have a real fear of some kind of collusion between Israel, the PA and Egypt,” he said. The addition of yet another source of antagonism between the two main Palestinian political factions has shattered hopes of Palestinian reconciliation any time soo. MP Dr. Mustafa Al-Barghouthi said on Wednesday that the Palestinian Authority’s negotiations with Israel had provided cover for the latter’s attacks on the Aqsa Mosque. 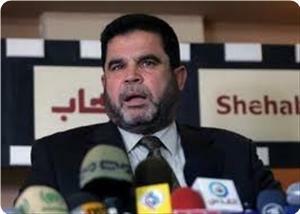 He told the PIC reporter that the recent escalation in Israeli violations could not pass without a response. Barghouthi advocated popular resistance along with a unified national strategy as an urgent necessity, adding that the “futile negotiation” process should come to a halt since it only led to more “disasters”. The MP said that the Israeli attack on worshippers and vigilantes inside the Aqsa Mosque today was “very serious” and necessitated a firm retaliation on the part of the Palestinian people. He charged that the attack was one of the fruits of returning to negotiations. He pointed out that the Palestinian people are the target of a “systematic war” that is daily escalating and the PA should immediately table the issue with the international criminal court and ask for punishing occupation for its crimes. Barghouthi asked the Palestinian negotiator to stop wagering on negotiations and to return to wagering on his people, national unity, unified strategy, and the multi-faceted resistance. MP Khaled Tafesh said that the Palestinian people would not remain silent for long vis-à-vis the Israeli occupation’s practices. He told the PIC on Wednesday that the Israeli arrogance and practices in the West Bank and Judaization schemes in Jerusalem would soon trigger a third intifada. The MP said that the futile negotiation, which did not bring anything good for the Palestinian people, was another factor in igniting a new uprising. Asked whether the Palestinians’ economic conditions allowed for a new uprising, Tafesh said that there would be no obstacles before the Palestinian people’s revolt and the bad economic condition would serve as another impetus for the revolt. The lawmaker explained, “The economic conditions, whether good or bad, will not sway the Palestinian people away from resisting occupation and standing up to its aggressive policy”. Hamas leader Salah Bardawil strongly criticized a speech delivered by U.S. President Barack Obama on Tuesday before the General Assembly of the United Nations, in which he used the term "Jewish state". Bardawil told Quds Press on Wednesday that U.S. President's remark about the Palestinian cause represents a serious transformation that threatens the fate of the Palestinian cause and a violation of the UN resolutions. He considered that the term "Jewish state" is very dangerous because it eliminates the right of return of refugees and stressed his movement's rejection of Obama's recent remarks. He added: "using this term violates the earlier resolutions of the United Nations, which recognizes Israel as a state on 2 conditions; the return of Palestinian refugees to their homes from which they had been displaced, and the respect of the indigenous citizens in their country, which was also a condition of the Balfour Declaration. The Hamas official stressed on the futility of the negotiations which is continuing in light of U.S. bias for Israel, and called on the Palestinian authority to stop the negotiations and search for a common national strategy to confront the occupation. 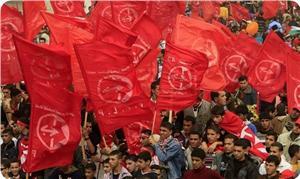 Bardawil also asserted that all these plots will never deter or undermine the resistance. The liberated prisoner Nazih Abu Aoun said that the prisoners have lost the most effective way for their release due to the PA persecution of the resistance. He stressed that the Palestinian prisoners refuse their release through humiliating negotiations, criticizing the PA decision not to go to the ICC. The liberated prisoner, who was recently released after 28 months in administrative detention, said that prisoners demand their freedom with dignity and reject indignity as a price for their freedom in reference to prisoners' release in return of resumption of futile talks . Abou Aoun has criticized the PA cancel to pursue the Israeli crimes in the ICC, calling for the release of all Palestinian prisoners. 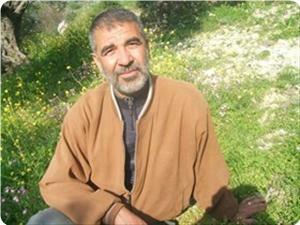 He stressed that the Palestinian prisoners need effective campaigning for their release and not only a show of sympathy. He pointed to the PA's double standard policy in dealing with liberated prisoners, where many of them have been re-arrested by PA forces due to their political affiliation. Palestinian President Mahmoud Abbas met on Wednesday, with US Secretary of State John Kerry. During the meeting, they both discussed the latest developments of the peace process, current negotiations and situations in the Middle East. President Barack Obama urged the global community to cast aside old prejudices and take the risks needed to help reach a peace deal between Israel and the Palestinians. Two years after Mahmoud Abbas made a powerful plea to the UN General Assembly to grant his people statehood, Obama said the United States remained "determined to resolve a conflict that goes back even further than our differences with Iran." "The time is now ripe for the entire international community to get behind the pursuit of peace," Obama told this year's UN summit in New York. "Already, Israeli and Palestinian leaders have demonstrated a willingness to take significant political risks." The Middle East peace process was relaunched in July ending almost three years of stalemate, after US Secretary of State John Kerry spent months doggedly shuttling back and forth to coax the two sides back to the negotiating table. With the guidance of newly appointed US special envoy Martin Indyk, Israeli and PLO negotiators have been meeting in private to hammer out some of the thorniest issues standing in the way of a deal to create two states, living side-by-side. In September 2011, Abbas handed over a formal request for statehood to UN chief Ban Ki-moon, and triggered wild applause as he addressed the General Assembly, vowing that the Palestinians were ready to return to peace talks if Israeli settlement activities cease. But that move was immediately rejected by Israel and the United States. 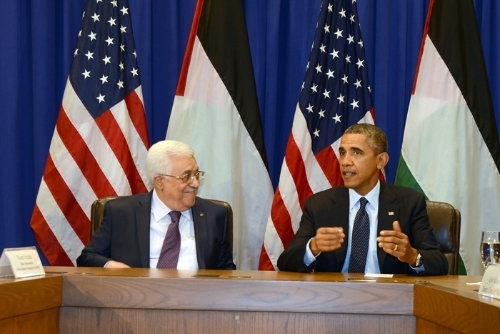 Obama, who met with Abbas later Tuesday on the sidelines of the UN gathering, praised Abbas for having now put aside efforts "to short-cut the pursuit of peace and come to the negotiating table." He also hailed Israeli Prime Minister Benjamin Netanyahu's release of Palestinian prisoners and said the "current talks are focused on final status issues of borders and security, refugees and Jerusalem." 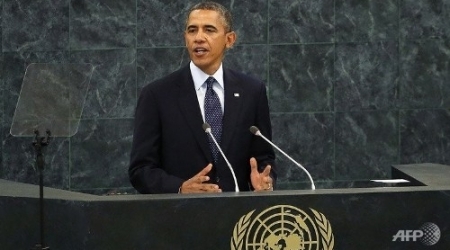 "Now the rest of us must also be willing to take risks," Obama insisted. "All of us must recognize that peace will be a powerful tool to defeat extremists, and embolden those who are prepared to build a better future," he said. "So let us emerge from the familiar corners of blame and prejudice, and support Israeli and Palestinian officials who are prepared to walk the difficult road to peace." Abbas said during his meeting with Obama that "we have no illusion that peace will be easy" but he stressed it was important not just for Palestinians but the region and the world. The two men met mostly one-on-one and Obama "encouraged Abbas, as he has Prime Minister Netanyahu, to move quickly in those discussions," a White House official said. "We have a window of opportunity here with direct negotiations, and the quicker that they get to the hard issues, the greater likelihood there is of success," he added. 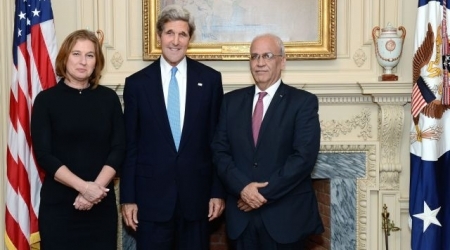 Kerry also met with Abbas late Tuesday after first holding separate talks behind closed doors with the chief Palestinian negotiator Saeb Erekat. The top US diplomat has insisted that the nitty-gritty of the negotiations should remain confidential to prevent leaks which could scupper the chances of reaching a deal with suspicion and distrust running high on both sides. Abbas, who will address the UN on Thursday, also met Tuesday with UN chief Ban. They discussed "the role that the international community could play in support of the Middle East peace process," Ban's office said in a statement. 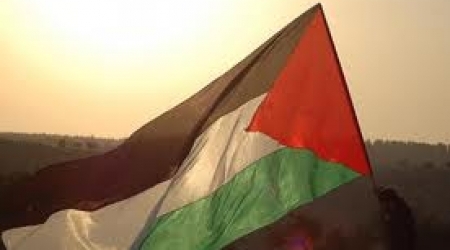 They also stressed "the vital need for the international community to unite to bolster the fiscal standing of the Palestinian Authority," the statement added. Kerry's team, in conjunction with the Middle East Quartet, is working on an economic plan to attract $4 billion in private investment to help shore up the Palestinian economy by investing in technology, housing construction and tourism. Palestinian President Mahmoud Abbas pledged to US President Barack Obama on Tuesday that the Palestinians will exert every effort possible to try to ensure peace talks with Israel are a success. Obama met with Abbas on Tuesday afternoon, after telling the United Nations that one of the two greatest foreign policy priorities of his presidency is the Israeli-Palestinian conflict. The US president commended the Palestinian Authority president for sitting at the negotiating table with his Israeli counterparts and for condemning violence against the Jewish state. "We've seen Palestinian and Israeli representatives discuss some of the most difficult issues that have been roadblocks to peace for too long," Obama said. "None of us are under any illusion that this would be easy," said Obama. Abbas, who spoke briefly, said that a peace agreement was in the interests of Israelis, Palestinians, and all those who live in the region. "We are fully committed to the peace process so that we can reach a final settlement that ultimately will lead to the creation of an independent Palestinian state that would live side-by-side in peace and security with Israel," Abbas said. Abbas said negotiators will need to overcome "several difficulties" but that the Palestinians are committed to the process. At a meeting last night with Jewish leaders, Abbas condemned terrorism in strong terms when asked about the killing of two Israeli soldiers in separate incidents in the West Bank last week. The US president devoted a large portion of his General Assembly address to the decades-old conflict, calling the creation of a Palestinian state a necessity for the dignity of its people and a requirement for the protection of Israel's Jewish identity. "The border of Israel and Palestine should be based on 1967 lines with mutually agreed-to swaps so that secure and recognized borders are established for both states with robust security provisions so that Israel retains the ability to defend itself, by itself, against any threats," Obama told reporters before the meeting. Obama is due to meet Prime Minister Benjamin Netanyahu next week in Washington as he tries to keep up the momentum in peace negotiations.